"Dear Ed and Frances, I want to thank you for creating such beautiful shoji screens for my parents. They were absolutely delighted with the beauty and craftsmanship of the project. They said the natural finish of the panels brightens the room and makes the space seem larger. I can't wait to see them in person when I visit my folks later in the year. Thank you also for delivering them in person. I just looked at the route on Google maps, and it's easily over a hundred miles in each direction. I didn't realize it was such a long trip for you. I truly appreciate the personal service. Best of luck to you and Shoji Designs." We do not deliver usually. But our client (CA) bought shoji for his 90 year old parents (WA). Since our client was not in town and we could not find a delivery service that would install the shoji and take away the crate and packaging materials, we delivered them ourselves. "The room is not complete yet, and I am going to work on the floors, but I wanted to share some pictures anyway... the shoji look absolutely gorgeous!" "I appreciate the follow up. Your customer service is just as good as the quality of your product. The owners are very pleased with their shoji doors and I appreciate the sample grid work you provided for our painters to practice on. If I ever have another need for shoji doors, you are my guy." "Dear Ed, I don't know if you'll remember us. 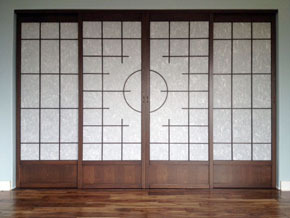 A dozen years ago, you made six custom shoji screen sliding doors for the closets in our bedroom when we undertook a major remodel of our home. As other stuff has come up on its unofficial "expiration date" (read: built-in obsolescence)?a dishwasher, an under-counter refrigeration unit?and in the aftermath of replacing a roof, refinishing English slate countertops and tile floors?we wanted you to know how grateful we are that we found our way to you to realize our vision for the shoji screens. They remain beautiful, unblemished (albeit for a few indiscernible nicks inflicted by our now 4-year-old grandson), and an ever-enduring grace note we're privileged to see (and open) every day. Your craftsmanship speaks for itself. We're pleased to see from your website that you're still here, still working, and bestowing your gifts upon others. We simply wanted to thank you. Best wishes and warmest regards for the New Year! May it be one of great joy, good health, and continued prosperity. We worked for these clients in 2005, received this really sweet note from them over the holidays. "Edward, It was great seeing you again and we look forward to having you work with us in our new home. 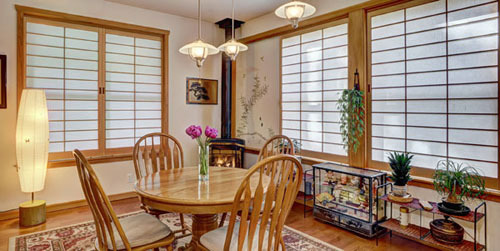 In 2003 you created pocket shoji window coverings for our living room and dining room. This was a new construction home so you worked closely with our builder throughout the project and the result was a seamless, beautiful addition to our Asian decor. The materials you used were excellent quality and have endured these 13 years, looking as pristine now as they were new. The sale of our home was greatly influenced by the beautiful shoji and how well they were made. When we bought our 'new' existing home we wanted to include some shoji accents and knew exactly who to contact! Thanks for working with us again and we are excited to see the finished project." "All arrived and all in good shape....we're very excited about this installation ..... Thanks for your great follow through..
"Thank you so much Ed. The shoji screen really is beautiful and looks so amazing in my studio. It really is a work of art. Thank You and many Blessings to you both. It was great working with you." "Yes the shojis are installed!!!!! They are so elegant! Many many thanks again for making the space wonderful. 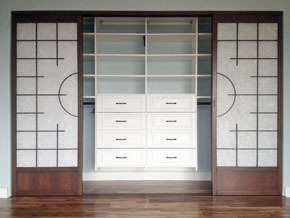 Francesca said she was astounded and impressed at the packing "
"The shoji doors are amazing. They look fantastic and provide an interesting architectural element to the room as well as being functional closet doors. The pictures don't do justice to what these add to the entire space. Love your work. If I ever build a home or renovate another one, I will be in touch!" "The shojis arrived and they are beautiful - as always. And they were in pristine condition so your shipping crate/nuclear bomb shelter was adequate for the trip. Here's hoping you have an outstanding 2016 and that you haven't both retired by the time we need to order our next batch of shojis! Thank you and it is always a pleasure to work with you both." "Ed & Frances, The shoji are now installed and Leslie and I think they look fantastic! We're really happy with the installation as well. Thanks for your contribution to our project. " "A brief photograph tour of our apartment - now 99% complete - shows how your outstanding craftsmanship is absolutely integral to our happiness with the results. We wish to thank you both for all your efforts. We are always available for reference or testimonials. Trust we are spreading the good word in southwest Florida. Kind regards "
"Hi Ed and Frances, Attached is a photo of our shoji doors in place. The install was easy and they work beautifully. "Dear Edward, The shoji screen arrived yesterday. I understand now why you charge the high packaging fee. Quite an effort and beautifully done! The screen is perfect. It is a real work of art. You are clearly a true artisan and the woodwork is smooth as a baby's behind. It looks beautiful. Thank you so much for your excellent work. Best regards"
"Thanks so much Ed. The screens are beautiful and works of art." Copyright © 2000 - Shoji Designs Inc. All rights reserved.